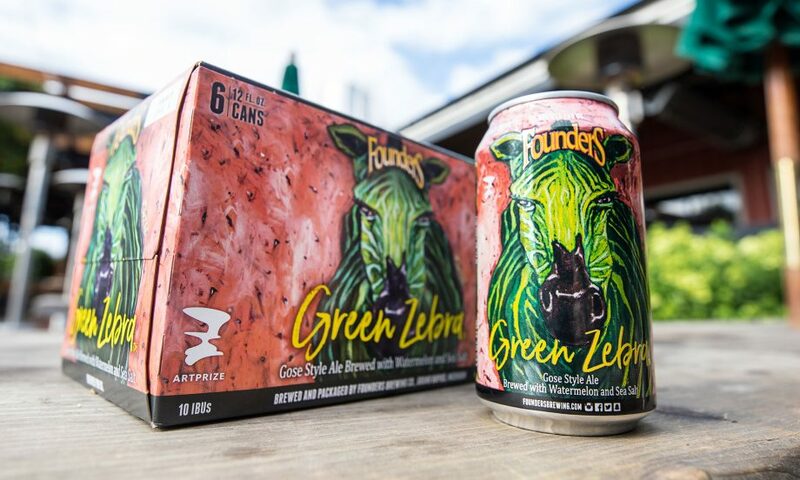 New Beer Release: Green Zebra, Brewed For ArtPrize 2017 - Founders Brewing Co.
Posted on July 17, 2017 by Founders Brewing Co.
For the fifth year, we’re brewing a beer to benefit ArtPrize, an art competition hosted in our hometown of Grand Rapids, Michigan. Previous ArtPrize series beers include Mosaic Promise, Pale Joe, Spectra Trifecta and more. This year, we’re looking forward to exercising our creativity again with a style new to our lineup. This year’s ArtPrize beer is Green Zebra, a gose-style ale brewed with watermelon and sea salt! Subtly sour and a little sweet, this ale is a refreshing take on a nearly extinct German style, gose. Watermelon is the highlight of this lightly-hopped treat and gives it a hint of satisfying juiciness. The soft mouthfeel and dry finish comes courtesy of the addition of sea salt, a traditional gose ingredient. Green Zebra comes in at 4.6% ABV and 10 IBUs. For the first time ever, we will be releasing this beer in 6-pack cans (yup, no bottles) in addition to draft. Green Zebra will also be available in all 46 states we distribute to. It will be priced consistently with our year-round lineup at $9.99 suggested retail price. As we have done for the past two years with Spectra Trifecta and Pale Joe, we reached out to our immensely talented Founders Family to create a piece of original work for the label. Our taproom’s own Jacob Wiseheart achieved that distinction and, with his striking and intense use of color and dimension, created a label that perfectly suits the lively, bright nature of the beer. This will be available in the taproom beginning on August 15. Look for it in on shelves beginning mid-August.